In “Lead By Example,” we covered the Sumner County, KS Sherrif Deptartment’s efforts to save some abused and neglected pit bulls. We briefly mentioned their disastrous attempt to contact PETA when it came time for the Sheriff to figure out what to do with the dogs they had just saved. Thinking that such a big, national orgainzation that advocates for animals could help them continue their rescue efforts, they reached out to PETA for help and advice. PETA has clearly defined itself as an organization that hates people more than it cares about animals. Many people in pit bull circles as well as other breed rescue and animal welfare areas know of PETA’s hypocracy. It has been discussed several times by our friends at KC Dog Blog such as this post and this one. Diane Jessup has some strong words on the issue as well. 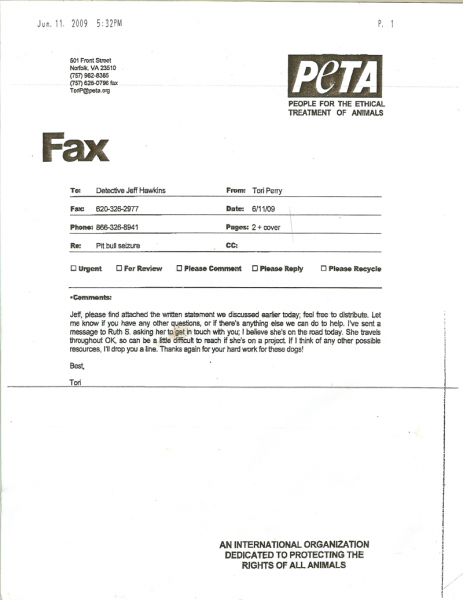 The cover page of the fax clearly has their logo and letterhead displayed at the top. At the bottom of the cover page we are graced with a “description” that belies the true content of the following pages. What a bunch of patronizing a$$holes. 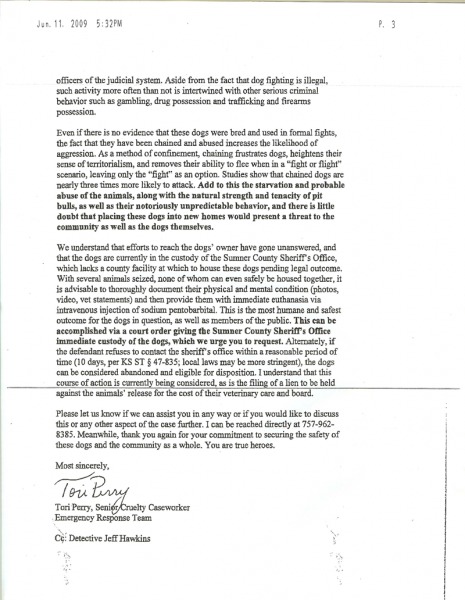 So we know the letter is from the People for the ETHICAL Treatment of Animals, we know they are dedicated to protecting animals and we know they like to talk to the sheriff’s department like they’re a bunch of 10 year old boys. We can expect from here that the sagely advice they give on page two will really help the sheriff save these dogs…right? Obviously, knowing that PETA has more than 2 million suckers they’ve fooled into thinking they actually care about animals supporters is helpful right now. Without the proper fan fare, instructions on how to care for dogs one has seized in a cruelty case are just more difficult to read. It’s PETA’s humility that lets us know that with them it is really all about the animals first. Here we go with the patronizing stuff again. Remember how happy they are to have such “animal crusaders” working in Sumner County. It becomes important later. With the heaviest of hearts I’m sure. This has become PETA’s answer to most things “dog” and all things “pit bull.” Remember how they are they are “dedicated to protecting animals?” Remember earlier when they were so happy to have such “conscientious individuals” in Sumner County? Why? 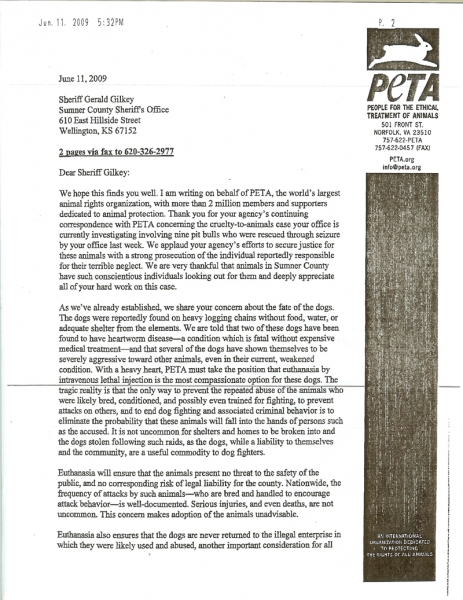 If the sheriff would have just shot the dogs on site and left them to rot at the end of their chain it would accomplish the same thing that PETA is proposing here. You’ll notice a “likely” and a “possibly” in there too, showing that PETA did a thorough investigation of the case before they recommended the whole-sale slaughter of these dogs by the people who were supposed to be saving them. Actually, while this has happened, it is uncommon. Particularly in this instance where the dogs are being kept behind 20′ fences topped with razor wire in the jail yard. That would be the dog-retrieval-break-in movie of the year, bar none. But PETA has to put this in for good measure to scare educate the sheriff as to the danger of keeping these dogs. This part is great. This is where they rely on 30 year old data from outdated studies and old science to talk about statistics and animal behavior. Where does their expertise come from I wonder…is it all the statisticians and animal behaviorists they get to pose naked for their ad campaigns? Indeed. Here we go again with all the wisdom they have gleaned from their naked experts. Also in here is “likelihood” and “probably” showing all the first hand involvement they have had with this case. And we all know how notoriously unpredictable pit bulls can be. So unpredictable they are used in law enforcement and therapy and assistance registries are willing to cover them with $1 million in liability insurance when they are on visits. So are you PETA, so are you.